This is a two step project. First you need to make the jar to pour the candle into. 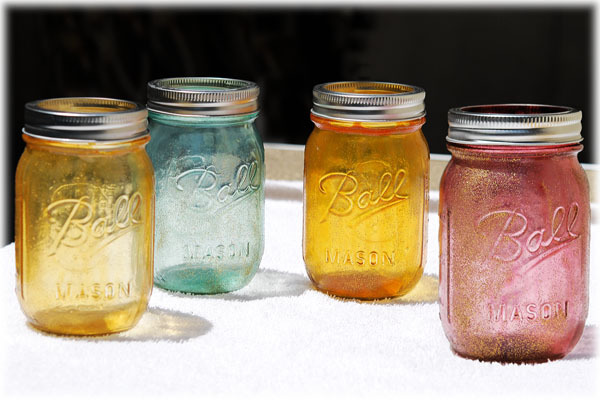 Follow the same steps you find in Tinted Blue Jar and Lets Do MORE Jars! on putting Mod Podge with food coloring on jars. I will go through the steps here (but without details and pictures, since I have already gone into detail with pictures on those pages). Be sure your jars are clean inside and out. Because I wanted to be able to put the lid on the jar to protect it from dust when not in use, and because a thick layer of Mod Podge makes that difficult or impossible, I ended up using tape around the screw part of the top. The best solution, which I finally settled on was packing tape. You might find something better, as that still wasn’t perfect. If you get some on there and try to pull if off after it dries, be forewarned, it may pull your Mod Podge off of your Jar, so CUT IT with a sharp knife or Exacto and then pull it off. 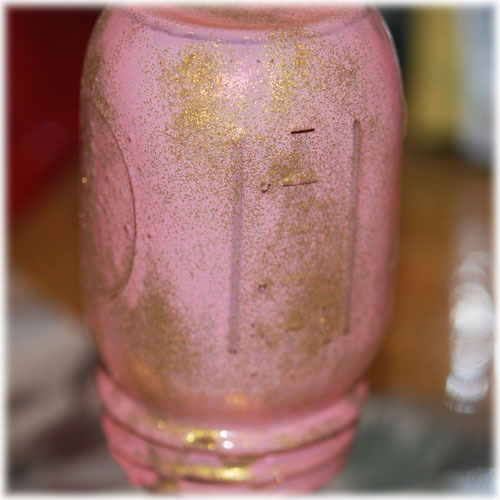 Pour Mod Podge into a container (I like to use plastic cups because for some reason I always have some hanging around taking up cabinet space –I don’t know why, I never use them but somehow they show up!). Mix a few drops of food coloring in. You can come up with your own colors, remember that they will dry transparent, so the color will not be exactly what you see when you mix it. But it’s fun to play with the colors. Just remember, it’s difficult to undo a color or go lighter, so just keep that in mind. 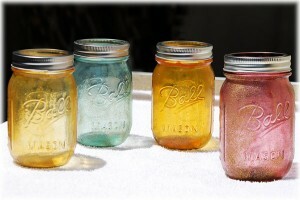 Once you get a color you think you like, cover the outside of the jar and let it drip a bit. Remember you are going to put a candle on the inside so you HAVE to do the OUTSIDE. 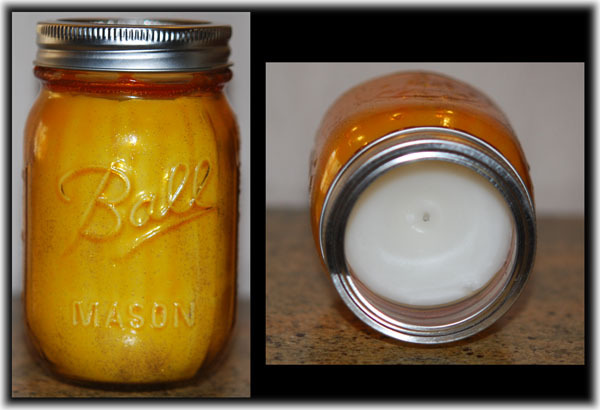 If you need more details on how to do this, please check out the other articles on Mod Podge jars. In addition, check out the cool thing my husband made for me here. I actually use it for other things too, including paper mache with jars as well. It’s an awesome little jar stand, but it’s oven safe. OK, now once you have put the colored Mod Podge on the outside of your jar(s) (I can only do one at a time because I only have one nifty jar holder for the oven), let it air dry for just about 5 minutes, while you let the oven heat up to about 170 degrees. Then, take your small paintbrush (I used a little child’s watercolor brush, a cheapie! ), dip it into the glitter and just sort of flick it at the jar. Get pretty close, but don’t touch the brush to the Mod Podge or you will make a mess of your brush. Once you are happy with the results, put your jar into the oven. It takes somewhere around an hour for these to get dry, but keep an eye on them. I usually set the timer for about 20 or 30 minutes and check them then, mostly because I am dying to see what the color is looking like. Just don’t leave them alone. Once it’s dry, let it cool and admire your beautiful work. 🙂 At that point you can clean up around the rim if you need to. If the edge is a little messy looking for you, the lid and/or a ribbon will neaten that up anyway. OK, now for the next step. I have made candles before years ago, and now I remember why I didn’t pick it up as a hobby. And I realize why hand poured candles are expensive. I can’t see it being my favorite thing. I guess I shouldn’t say that about something I’m getting ready to tell you how to do. 🙂 I just have to say, there are crafts I find fun and relaxing and other things I’m glad other people do. I think candle making is one of those things I’m glad other people love to do. First, please remember (as if you could forget) hot wax is HOT! I bought 2 tubs of wax which were 2 lbs each. I thought I would have plenty left over to make more. HA! A one pint jar takes about a lb of wax. I would never have thought that. I used Yaley Creme wax and followed the directions on the back of the lid. You simply melt the wax in a double boiler of some sort as directed. I did not put a color into the wax as I wanted it white so that it did not fight with the color of the jar. 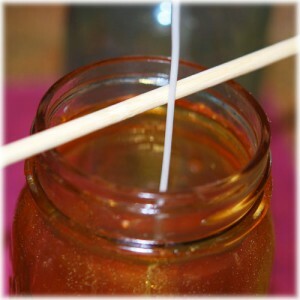 I did add a scent, which you do after the wax is melted and then cools down to 175 degrees, stir well. Pour the wax carefully. Don’t overfill the containers. Don’t spill wax on yourself and I recommend putting something underneath your work area that you can clean or throw away (I used a disposable cutting board but newspaper would be great). Wax can be difficult to clean off of things you care about. Once you have filled your candle, let it set for 30 minutes to one hour and then poke holes in the wax close to the wick to let the air escape (as the instructions suggest), remelt leftover wax and fill in the “well” that you will see around the wick area. Keep doing this until you don’t have a little hollow area around the wick. I had to do it 3 times. When it was done, I screwed the metal ring on and, hey, I thought it looked pretty good. Good enough to give for presents! 🙂 I’m kind of anxious to see how well they burn, but since I’m giving them as gifts I’m not going to burn them. The jars are just gorgeous before you even started on them but they make a fabulous candle – and the colours set them off really well. Thanks Wendy, I really enjoy the jar making part, but I really do NOT enjoy candle making. It makes too big a mess in my kitchen and I don’t like the feel of wax on my hands and everything. And hot stuff scares me… 🙂 But I’m glad you stopped by.